A completely unique and original story from an author who knows what she's doing. It was a slow-burner and had lots of little tidbits in the footnotes. It is an elaborate read, but I liked it. It was a nice change of pace from all the murder mysteries I've been reading. I liked the fact that there were no dirty words or stuff and the story was clean of double entendres. I think that this book deserves more popularity and more praise. Amazing piece of work, Susanna Clarke. I could kiss you for writing this beautiful story. I mean, if I had to talk about her narrative then I'd need a whole day. Seriously. Her use of premonition in revealing key characters, plot twists and story elements is insanely clever! The novel is rich in footnotes that tell us more about this world she is building. The footnotes give us lots of insights into our characters and many, tiny branching stories. Mr. Norrel - The one that is secretive - secretly jealous, secretly afraid, secretly sincere. Jonathan Strange - The one who is likable, friendly, jovial and talented. Childermass - The one who appears very rarely but the one you miss the most. Arabella Strange - The one who sets the bar for wives all over England. Lady Pole - The one who looks like a butterfly but stings like a bee. Mr. Honeyfoot - The one who should have had his foot in his mouth, honey. Drawlight, Mr. Lascelles - The ones who are supposed to be comic reliefs but whom you hate. Vinculus - The one that shocks you with his story. John Uskglass - The one you want more of. The Fairy - The mean one that you were happy to see defeated. Stephen - The one you root for. 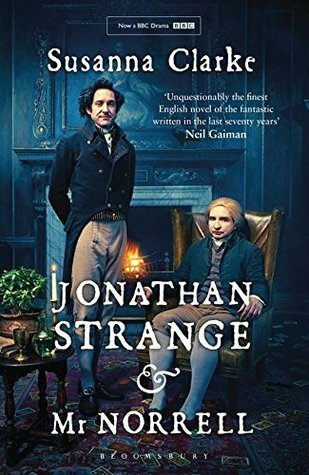 Sign into Goodreads to see if any of your friends have read Jonathan Strange & Mr Norrell. “Mr Norrell determined to establish himself in London with all possible haste. "You must get a house, Childermass," he said. "Get me a house that says to those that visit it that magic is a respectable profession - no less than Law and a great deal more so than Medicine." 0.0% "ooooo I'm so excited to start this !!!!" 9.0% "Not only the main plot but the sub-plots and titbits are also interesting!" 12.0% "I love it so far!!" 15.0% "Wow!! That was an astounding magical feat, Mr.Norrel\n \n The imagery is in my head...and wow...it's grande!" 16.0% "Oh C'mon that was the most boring chapter... I expect more sass... more humor ...more magic!!" 7.66% "Restarted it and loving it! So many laugh-out-loud moments so far hahhahaha!" 15.32% "Ooooooooohhhhh! A Prophecy! Could it be....? yes! yes! yes!" 18.01% "Funny and Spooky! awesome combo"
22.09% "Susanna, I could kiss you 💋"
24.88% "Oh,no. I think I know what's gonna happen and WHO is gonna do it!!!!" 47.46% "Oh My God! The story takes a dark turn"
50.35% "That is such a dull, boring and unremarkable name for the Raven King! :("
62.99% "Whattttt?! Don't do this! Don't spring this on me like that!" 75.12% "It's like reading a hundred different stories in one big story." 99.5% "Omg.. I have so many questions!!" 100.0% "THIS is how you decide to end it? Abruptly and mysteriously. :'("
lol! Great review! But 1000 pages! Thanks !! Yeah 1000 pages, but it hardly feels so. you should give it a try.